In the search for more battery power for your iPhone 6, an external power case can let you go several days without worrying about dropping everything to charge your phone. While the iPhone 6 boasts the best battery life yet, a full day of activity can drain your power before you know it. I tried out several external battery power cases for the iPhone 6 and found the Tylt case to offer the most capacity and versatility. 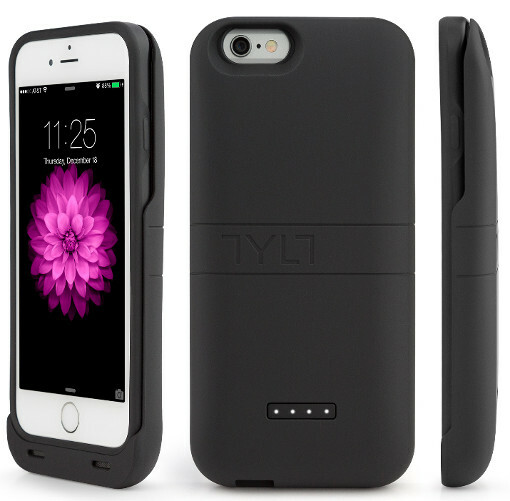 The Tylt ENERGI Sliding Power Case for iPhone 6 ($99.99 at Amazon) features a removable battery sleeve that provides an additional 3200mAh of power, more than doubling your phone’s battery life. This is more capacity than any of the other cases I tested. Like the others, this case and charger also includes battery power indicator lights on the back. A clever sliding feature allows you to use the dual-layer inner case with or without the battery sleeve, so when the phone is already at full power and you’d rather carry something lightweight in your pocket or purse, you can easily remove the extra bulk simply use the inner case. Pros: With 3200mAh of additional power, the Tytl Energi is one of the highest capacity external battery cases available. The versatility and ease of the sliding case provides the best of both worlds: a thin, protective case and power when you need it. Cons: The Tylt Energi is only available in black. A headphone extender jack is not included for times you’re not using Apple headphones, but the packaging includes a toll-free number where you can request a free headphone extender jackafter providing proof of purchase.